Space,The Last Frontier. This is the space~ blog of Spectre as he's airborning and blogging thru dark edge of pace, nebula, dark hole, space pirate, accidental explosion coz from eating too much "Ramli Burger", buying 4D online with 6 month delays, encounter space loan shark aka "Space Along", girly alien, Space Green Floating Lattle bar and etc. Er! Wait a minute! *Drinking a hot Milo* and pressing a certain button and pam!BE HOLD! The space was conjured by the touch of my powerful hand! ROFL! Did I just witness "The Milky Way" on my small cramp room? 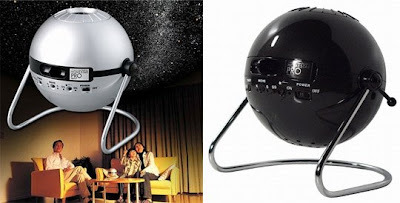 Introducing the "The Sega 'Homestar Pro' (*259 US Dollars*) home planetarium now uses a new professional-grade lens and brighter LED light for more detailed projection of 10,000 stars and planets! This also helps to reduce any blurring on the edges and give a clear, crisp projection. Designed by artist Kagaya, the Star Discs are amazing in their color, depth, and realism. The shooting star function adds even more action to the slow celestial rotation. "In other word, impressed yourself and whatever fella or kid nearby as you are *virtually* transported into space minus being strapped into crude, unstable and dangerous rocket based spaceship. ADRIAN : U WAN IT CAN GO BUY IT ONLINE!